Its rain and more rain over here which is DE-PRESSING! So i’ve decided instead of moaning to you all i’ve decided to make a short list of things i’m grateful for this week so far! 2. My Son is finally speaking lots! I’ve waited and waited for the quiet little mumbler to start saying words and we are finally there. Him shouting “DAAADDDDEEEYYYY” at random men, ie the bin man, the man in tesco car park and any other general males walking about, can be slightly embarrasing, but hey i’ll take it! 3. Amazing beef and ale pie last night with hubs. NOM, NOM and NOM! it was the best, to the point where i sang that pie’s praises to anyone that would listen last night. 4. Vintage ebay deals… oh yes i am a bidding/ebaying demon! I have sold some stuff on ebay and therefore funded a whole vintage array of goodies. Can not wait for Mr Posty to deliver my goodies! 5. This pretty dress, which cost nothing as i returned something. So apparently my go to combo is dress, cardi, belt and flat pretty shoes. I wear this a lot don’t I! I started thinking maybe i should do something different , you know, mix it up, go a little crazy. But really, this is my fav. This is my happy (outfit) place. Girly dresses belted with cardi’s. I seem to be having complete tights/hold ups/pantyhose issues of late. These were tights, and i went to the toilet went to pull them up and my hand went through them. I proceeded to do the exact same thing later on that day on the other side. Between that and hold ups loosing their holding up powers i give in and should just embrace (cold) bare legs! Ok lovely’s, what ya been up to anything nice? Tell me, is the weather glorious where you are or are you suffering the rain like me!? Seeing you in this pretty dress in the rain cool my soul and my doy in this tremendous heat. I also try to keep calm, but in extreme hot conditions for this time of the year. I couldn´t stop laughing at your son calling daddy at random men, hehehhehehe. I am adding you to my pinterest look this second. I love that brooch you have on. It goes perfectly with the shoes and the umbrella. Pretty, pretty, pretty!!!!! 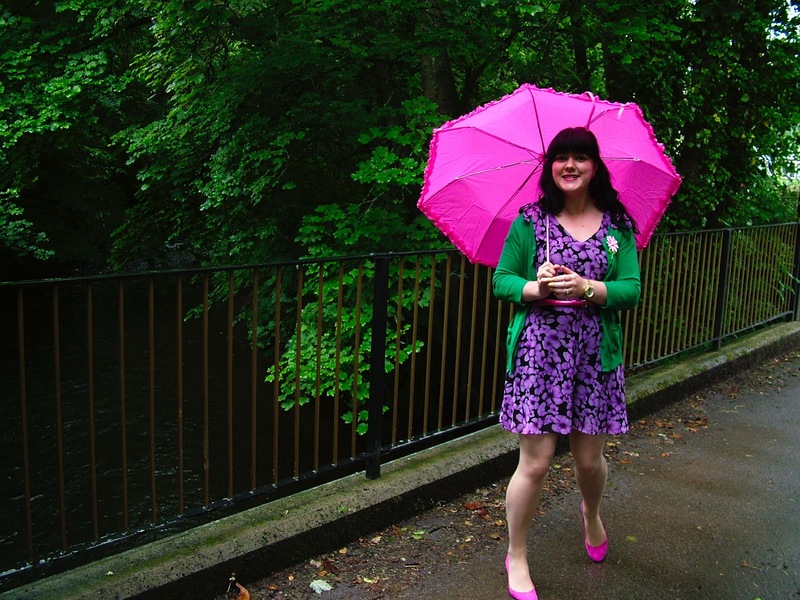 Rachel you look like a ray of sunshine in all this awful wet weather… I especially love that umbrella – so kitsch and gorgeous! This is a really great look! 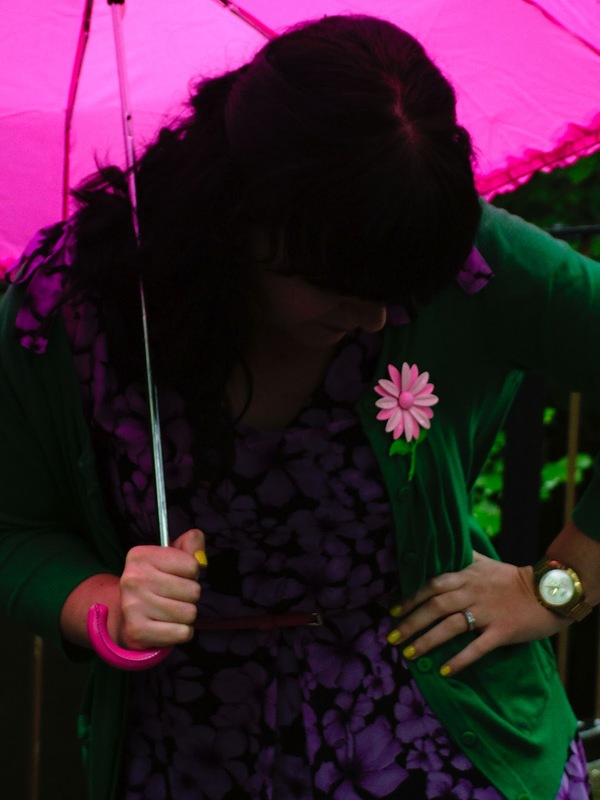 I love the use of color throughout, even the umbrella is bright! I love it! I am in love with the color of the print on your dress. So on trend and fabulous! 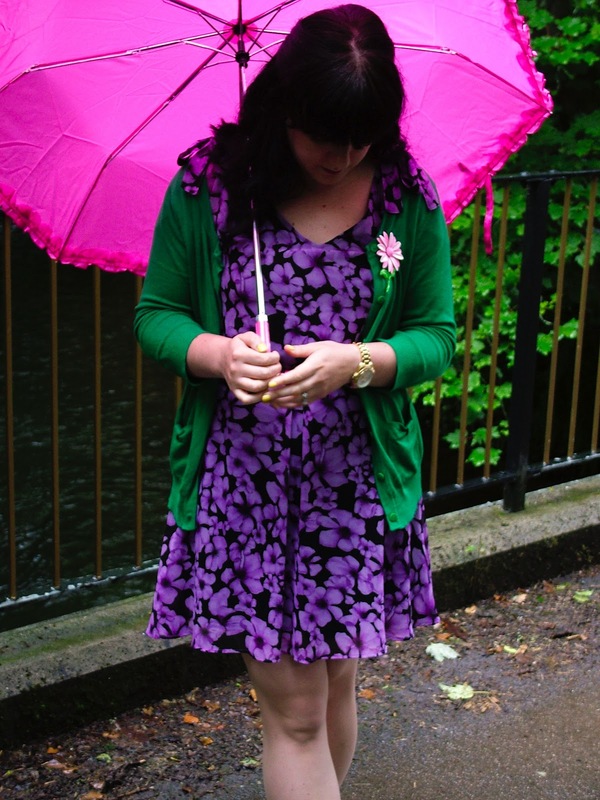 I love this outfit, and the bright umbrella is just a perfect way to make dreary days a little bit happier! I love it when kids find their voice! What a lovely outfit! 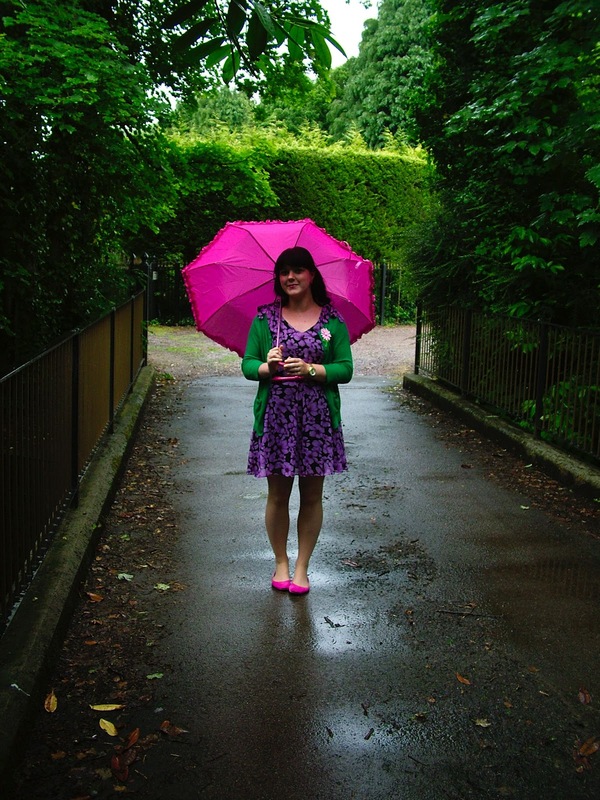 I love the bright umbrella and shoes! Rain rain rain in Manchester, should be a nice day tomorrow though! You are one stylish lady! Thanks so much for posting. I am definitly adding your button to my favorites. I am looking forward to a day where it doesn't rain! Bloomin' blogger ate my comment.. grrr.. I will try to recreate it! I am so fed up with all this rain. At least you look stylish in it though! Love the dress, the colour looks gorgeous on you. I adore how you put outfits together. Such a lovely combination of green and purple. The print on your dress is amazing! We're suffering the rain too unfortunately. And the muggy-ness. And the thunder and lightening – we had our first absolute CRACKER of a thunder storm last week and one of the nearby underpasses flooded right up to the ceiling! 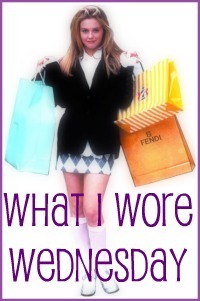 i love your way of thinking…it's free because i returned something! that is so how i am. i love your dress. happy to hear you are feeling better!! Hi Rachel, thanks for your lovely comment on my blog. Love the style of your blog. 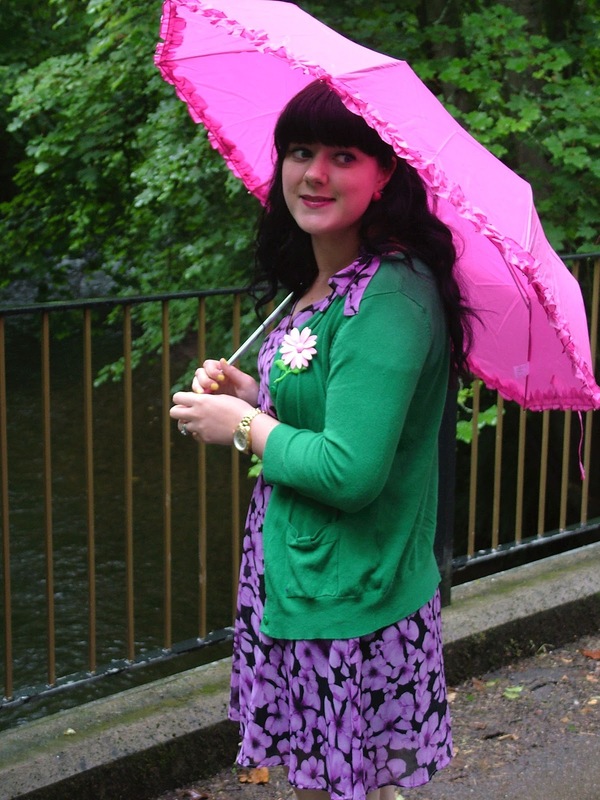 I need that pink frilly umbrella… so cute. These colors are FAN-tastic. 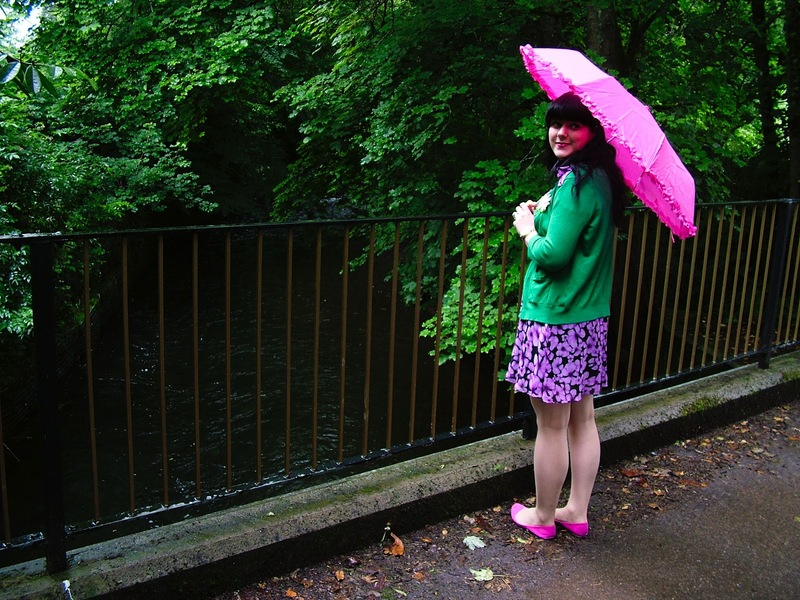 I mean, could you have chosen a prettier, happier outfit for a rainy day?! I think not. I think it's pretty awesome that you're changing to a positive attitude during the rain. It seems that in Wales you get so much, why bother wasting your good mood on it, right? you look adorable with that umbrella! i wish we got some rain here, it's 100 degrees! oh your blog is absolutely delightful! let's follow each other!